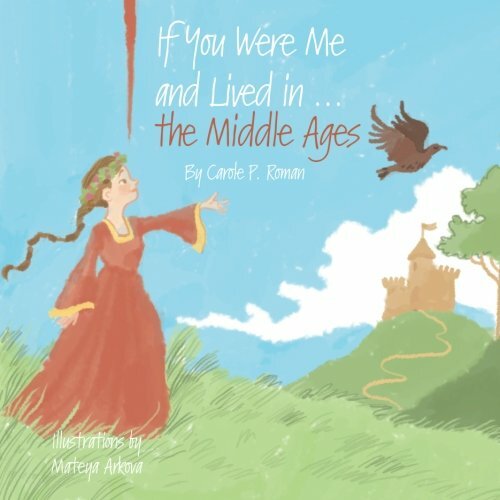 If You Were Me and Lived in the….Middle Ages by Carole P Roman is not your typical children’s book. First off, it’s thick! There are over 70 pages filled with illustrations and story as well as another dozen for a glossary. I was very impressed when I opened it up and I hadn’t even started reading yet! This is definitely a book I’ll be reading to Peyton. The layout of the story is 1 page has plenty of text telling of the way things were back in the Medieval ages and the accompanying page has an illustration to go along. When you combine the pages it’s like a third of writing and 2/3rd illustration. There is plenty for your little one to look at and take in while you are reading the story. The book start off showing us how a town back in 400 would have looked. Instantly, Peyton noticed a lot of differences. Where are the cars? That was her first question. I explained to her cars were not around during the Medieval ages and that people got around by walking or horses. She seemed ok with this answer and we moved on. Peyton was taken back with learning about how the different lands worked and people’s responsibilities. It’s weird for her to think your job is based on the family you are born into. She’s always been taught you can be anything. But back in the Medieval ages if you were born to a flour mill owner, you learned how to mill flour and that was what you did. Throughout the book you will learn about the different tasks, how there were different land lords, what it was really like to live back then. It led to so many talking points for us. We talked about how things are different today than back then. All the different tools and resources we have to complete a job. And how we have so much more than they did back then. The biggest shock to Peyton was medicine. She was taken back when she learned they used your birthday to treat you! All Peyton has ever known is Western medicine with a little bit of holistic healing. She thought it was ridiculous for them to rely on your zodiac sign to treat you. If you are looking for a book that is going to spur conversation and teach your child a history lesson in a fun and engaging way this book will do it. If You Were Me and Lived in ….Middle Ages is available online.